Successful businesses require a lot of back-end work in order for them to function as efficiently as possible. Businesses need ample space for proper documentation, inventory, tools, and other day-to-day materials without using up valuable space in their office or storefront. Having extra space opens up your business to more efficient work environments and greater retail opportunities. A self-storage unit for businesses is a smart and convenient way to solve organizational issues, provide storage solutions, and better manage inventory. 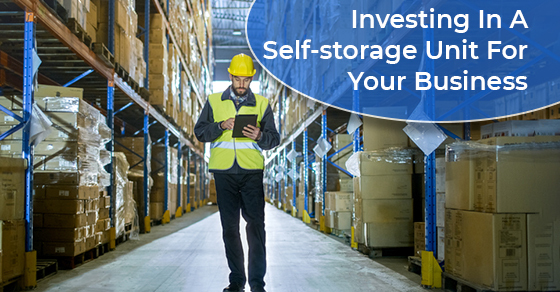 If you’re still on the fence about whether or not a self-storage unit will benefit your business, take a look at these common reasons businesses find it’s a good investment. A clutter-free workspace is a more productive workspace. Have you ever tried to pick out a special outfit for an important meeting or interview while your room was a complete mess? How frustrating was it to have to navigate around all the mess and clutter in order to find what you needed? An organized and clear workspace is more productive because people are able to easily get around as they need to in order to access tools or materials to do the job. It’s also easier to focus and clear your mind when you’re in an organized environment. Over the years, the number of documents can really add up and take up quite a bit of space. What once used to fit in a tiny office desk in the corner of a small office has now become stacks of boxes filled with documents, taking up an entire storage closet. Time for more space! A self-storage unit is the perfect solution for this. You don’t need to access historical documents on a weekly basis, so why let them take up valuable retail space at your business’ location? Move them off-site to a secure location and easily access them when needed. Many retail stores in shopping centres and plazas don’t have the luxury of extra storage space; if there is onsite storage space available, the cost of that space is usually marked up since it’s likely high in demand. A self-storage facility is an excellent way to reduce storage costs by housing seasonal items, or for storing large purchases planned for future sales. Many businesses change their aesthetic as the seasons change. During this time, storing special furniture and decor pieces in a climate-controlled self-storage unit can make the transition between seasonal trends go much more smoothly. Renting a storage unit for your small business can actually save you money that you can set aside for your company’s future. Your small business can benefit from storage not only to save you money but to free up your showroom for bigger more eye-catching displays, giving you the ability to earn more money per square foot. Jiffy Self-Storage is one of the most reliable and trusted self-storage facilities in the GTA. Some clients have even been choosing to store their trusted belongings with us for over 20 years. For more information, call Jiffy Self-Storage at (416) 745-4339 or contact us here.